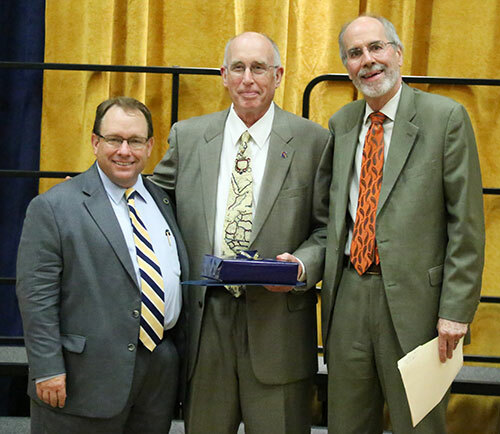 Bob Valentine, center, received the Kern Alexander Book Award at the 2017 Faculty Awards Banquet in April. He is pictured with University President Bob Davies, left, and and Vice President for Student Affairs Don Robertson. The Kern Alexander Book Award is given by the Council of College Heads to a member of the residential college faculty who has made special contributions to the Residential College System in the preceding year. 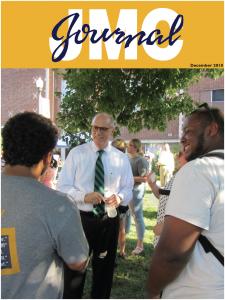 JMC’s Robert Valentine, a former head of Elizabeth Residential College, was recognized for his volunteer work with the colleges and particularly for his public promotion of the residential colleges as a meaningful part of the Murray State experience. 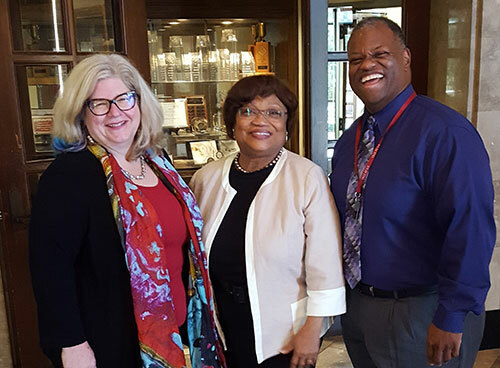 Leigh Wright, assistant professor of journalism and mass communications, presented three sessions at the Broadcast Education Association conference in Las Vegas. 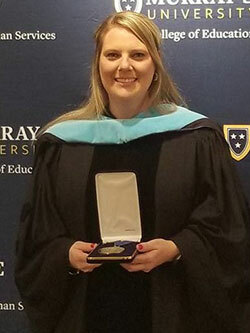 Wright received a BEA Ignite Scholar designation for her peer-reviewed presentation “Never Let Them See You Cry: Teaching Student Journalists How to be Human First.” The BEA Ignite program is a peer-reviewed competition where 10 presentations of the best teaching ideas are selected. She participated in two panels. 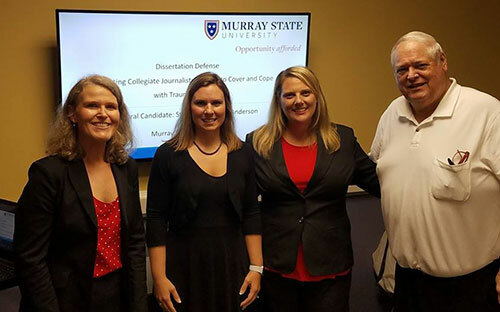 For the first one, she highlighted Murray State’s journalism capstone and joined Sandy Henry of Drake University and Cliff Brockman of Wartburg University to discuss the challenges and rewards of conducting multimedia capstone journalism classes. For the second one, she joined Chandra Clark of Alabama and Gina Baleria of San Francisco State to discuss how to use live-streaming tools in classes and how news organizations use these social media live-streaming apps. For all those people who think college journalism professors get to spend their summers relaxing by the pool, think again. Leigh Landini Wright, assistant professor of journalism at Murray State, spent much of July as an “intern” for WTVF Newschannel 5 in Nashville, Tenn. Wright received a faculty development fellowship from the National Association of Television Production Executives Educational Foundation to spend three weeks in a television newsroom. During her summer immersion, Wright followed news crews and multimedia journalists in the field, studied social media trends with the web editors, shadowed web editors and shadowed producers. The immersion proved helpful for revamping course assignments in the multimedia writing class and the journalism capstone. As the academic year continues, Wright plans to add new assignments based on her observations of a top 25 market. The fellowship provides Wright with an opportunity to attend the NATPE conference in Miami in mid-January. 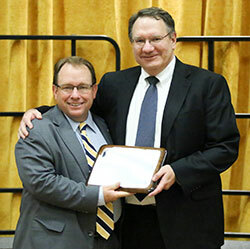 Murray State University has awarded Gill Welsch the Faculty Award for Distinguished Service in recognition for his contributions to the department and greater university. He received the honor at the 2017 Faculty Recognition Banquet in April. Welsch, a senior lecturer, joined the faculty in August 1992 and has served as head of the advertising major and adviser for the MSU Ads Club since that time. Gill Welsch, right, was recognized by MSU President Bob Davies for his service to the department and University at the spring Faculty Recognition Banquet. He has been the department’s internship coordinator since 2012. He is also author of the department’s advising handbook. Welsch has been a judge for DECA and FBLA competitions since 2000. He has also served as secretary of the College of Business Undergraduate Programs Committee. As a member of the university’s Bring Learning to Life Advisory Committee, he helps to oversee the university’s quality enhancement plan for experiential learning. Since 2014, he has been a faculty marshal at commencement exercises. Welsch is a staunch supporter of the Residential College system. He is active in Hart College, serving as a member of the Hart College Advisory Committee. During the Great Beginnings move-in days, he coordinates the loading of the elevators in Hart College. Welsch has also served as faculty adviser for the Nu-Rho Chapter of Zeta Phi Beta Sorority, Inc. from its founding in 2000 to 2016. He currently serves as honorary faculty adviser. He has also served as a referee for the American Academy of Advertising’s annual conference since 1994.